Every abused or neglected child needs a caring adult to advocate for his or her well-being. That's where Richmond CASA comes in. Court Appointed Special Advocates ("CASAs") are everyday citizens appointed by judges to watch over and advocate for abused and neglected children. This is done by being the information gatherer for the judge. 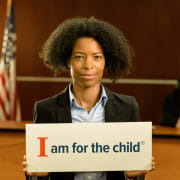 You'll meet with the child, speak to their teachers, counselors and family/friends to help the judge see the whole picture when determining the welfare of the child. CASAs make sure children don't get lost in the overburdened legal and social services systems. Volunteers stay with each case until it is closed and the child is placed in a safe, permanent home. For many abused children, their CASA will be the one constant adult presence in their lives. Richmond CASA urgently needs more volunteers to fill this important role. For more information, visit grscan.com/be-a-casa or email heather.farber@richmondgov.com. Please note that indicating your interest for volunteering at this time is not a firm commitment. CASA volunteers must complete an extensive background check, interview and training process.